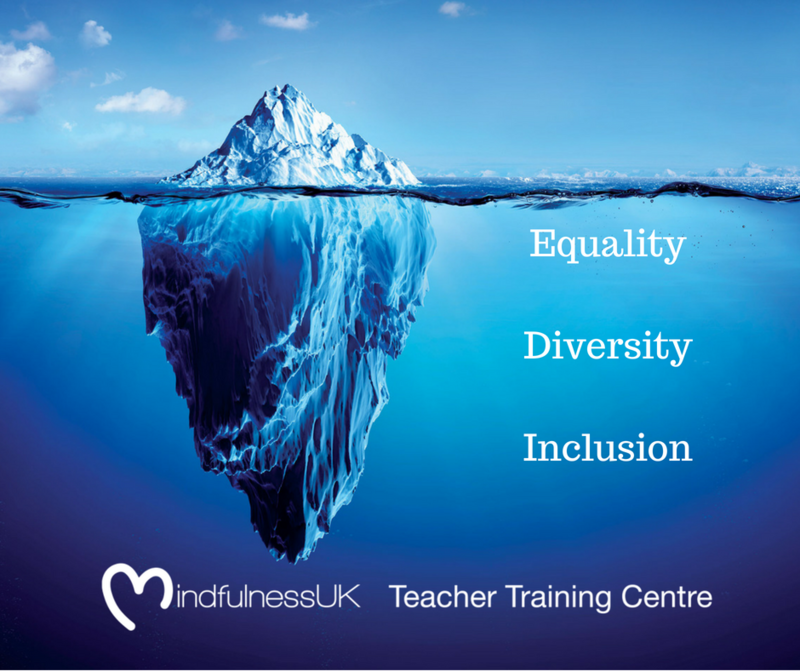 How does MindfulnessUK include Equality, Diversity and Inclusion in the work they do?..here’s how..
Angie Ward from MindfulnessUK completed the IMCPP, has a 20 year background in health and social care and now teaches the Integrating Mindfulness and Compassion in Professional Practice (IMCPP) and Master classes to graduates on how to work with vulnerable children and adults. The incredibly successful Minding Your Health in Education (MYHE)Programme was taught in both mainstream and Special Educational Needs (SEN) provision, it included ways to differentiate and work with children and young people with additional needs, Angie Ward and several IMCPP graduates who contributed had experience of working inclusively. An Educational Psychologist was taught some of the practices of the Minding Your Health In Education MYHE programme in a one day Masterclass with Angie after completing the Mindfulness Based Stress Reduction (MBSR), she now goes in to different schools supporting children with SEN and complex needs who are having problems staying in school provision and this helps them stay in education and thrive. To find out what Mindfulness and Compassion practices benefitted them, and from their experience how they felt Mindfulness and compassion would work in a digital application. A lovely project that required a Mindfulness and Compassion teacher with the skills and expertise to differentiate and engage a wide range of children and young people with varying needs, both for in class and offer home practice in an inclusive and accessible way. The young people presented their findings and ideas dragons den style. MindfulnessUK are Consultants, working in partnership with The Mental Health Foundation (MHF) and The Foundation for people with Learning Disability to research how to widen the reach of Mindfulness to people with Learning disabilities and their families. Angie Ward leads MindfulnessUK as part of the Working party, hosted by The Mental Health Foundation (MHF) and The Foundation for people with Learning Disability consisting of many different organisations, including Bangor University, developing Mindfulness and Learning disability good practice guidelines. Karen works one to one with clients who have Huntington’s Disease, teaching Mindful Movement to help with core stability, focus and communication skills. Karen has taught Angie through supervision to also work with this client and Angie now brings a music element to vary the programme. The outcomes are excellent, this client has kept her mobility. Using the toolkit from MYHE programme, Angie differentiates the practices and works with children and young people who have complex needs, teaching parent and child Mindfulness and Compassion simultaneously, this works as there are no child care issues for the parent, it helps them bond and communicate more effectively and develop a positive relationship. The parent can support the child with home practice.